Ashley Marquez is an Outreach Educational Specialist for Fort Irwin, California. She attended Texas Tech University in Lubbock, Texas and decided to put her educational goal on halt to join the United States Army. Shortly after her time in the Army, she decided it was finally time to achieve her higher aspirations in life. This included setting her educational goals. 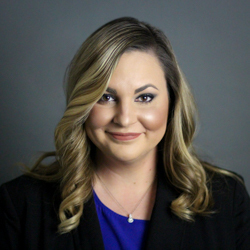 While working two jobs, raising a two-year-old son, and her husband serving as a drill sergeant, Ashley managed to graduate with her Bachelors Degree in Business Administration from Columbia College in a year and a half. “Now I am beyond content with the aspirations I have set for my life; as well as my family” states Ashley. Ashley Marquez was born and raised in El Paso, Texas. She is a dedicated veteran who is married to an active duty service member. She has two beautiful children who hold her heart in the palms of their hands. She grew up in a loving, tight knit, and caring family. She believes family is all you have, so you should love them, cherish them, and never let them go.